Mélomanes misogynes de tout poil, il faudra vous y faire : on va finir par voir un nombre croissant de femmes chefs d’orchestre : il a déjà fallu que vous vous habituiez à en voir un nombre croissant au sein de l’orchestre (même aux cuivres !) – on se rappelle de la polémique lors du rejet par vote en 1983 de la clarinettiste Sabine Meyer par les Berliner philharmoniker après sa période probatoire : 73 contre, 4 pour… – Sans remonter à Fanny, la sœur de Félix Mendelssohn, on ne sait plus qu’il y eut de nombreux chefs d’orchestre féminins de la fin du 19e siècle à la 2e Guerre mondiale, en général à la tête d’orchestres entièrement féminins dans les années 20 / 30, à l’existence souvent bien éphémère. Two young feminine conductors that we know a little: Susanna Mälkki, leader of the Ensemble Intercontemporain, who impressed us in two discs of contemporary music (Manoury & Mantovani). And Serâ Tokay, who has just given us an interview; she had just founded her chamber orchestra, “Philharmonie de Chambre Lutèce”; she impressed us in the two chamber symphonies by Schoenberg in Paris, some months ago. 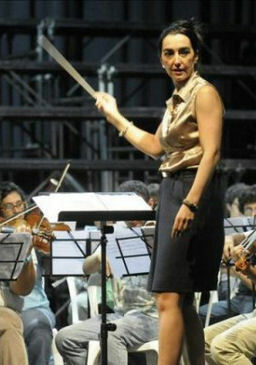 To our supposed misogynist music lover, what about, if by extraordinary, a woman conducts the orchestra dressed in a skirt… Well, Silvia Sanz Torre did it! Some conductors are missing, since I could not get their birth date, even some wouldn’t give it to me… See also this list. From the New Yorker, an interesting interview :”A formidable figure in Russian music, Temirkanov served as a mentor both to Gergiev and later to Petrenko. The interviewer, the Paris-based pianist and composer Elena Gantchikova, deserves credit for grilling him. A Russian-speaking friend provided this translation:Q.: In your opinion, could a woman conduct? A.: In my view, no. A.: I don’t know if it’s God’s will, or nature’s, that women give birth and men do not. That’s something that no one takes offense at. But if you say that a women can’t conduct, then everyone’s offended. As Marx said, in response to the question “What’s your favorite virtue in a woman?”—“Weakness.” And this is correct. The important thing is, a woman should be beautiful, likable, attractive. Musicians will look at her and be distracted from the music! Q.: Why? 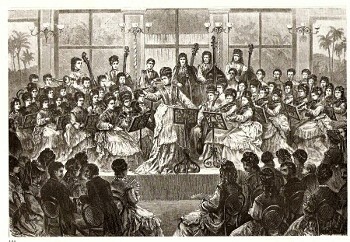 There are women in the orchestra; people indifferent to a women’s charms. Besides, how many times would you be enraptured by appearances? After all, it’s something you tire of, and switch to the heart of the question. Statistically, of course, there are women conductors. A.: Yes, they do exist. Q.: Nevertheless, you maintain that these are less than women, or less than conductors. A.: No, simply that in my opinion, it’s counter to nature. Q.: And what is it in the conductor’s profession that runs counter to a woman’s nature? That’s counter to the essence of the conductor’s profession? Jorma Panula has been the most successful spotter and trainer of conductors for the past 30 years. His pupils include Esa-Pekka Salonen and at least 20 others who hold international posts. Q: Do you think it is good that women enter the profession and become conductors? JP: No! What the hell, we have men already. It is such a limited profession… They can try, but it is a completely different deal. I can’t comment on media or public opinion. But women… Of course they are trying! Some of them are making faces, sweating and fussing, but it is not getting any better – only worse! They can come [to my masterclasses] and try. It’s not a problem – if they choose the right pieces. If they take more feminine music. Bruckner or Stravinsky will not do, but Debussy is OK. This is a purely biological question. SVP rajouter a votre palmares Mme Zahia Ziouani. @thierryvagne Mais attention pas par égalitarisme. Par le talent.